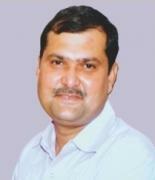 Padhy, Pravat Kumar. Songs of Love: A Celebration. Kolkata: Writers Workshop, 2012. Pp. 48. Price: Rs. 100/-. ISBN: 978-93-5045-029-1. When he is alone, he recalls her. 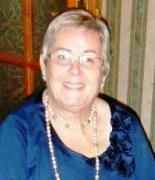 The letter she sends brings “a fresh breeze of remembrance.” Love for him is “an act of creation.” Soon a baby is born. He welcomes the beloved’s womanhood that offers him “a gateway to another new poem.” She assimilates love for a noble cause. Both of them discover “petals of love and glee” in the sunny and innocent smiles of their kids. He feels that these are the flowers of love that “confer together” while “weaving the inspiring Generation link.” He goes back and reminds in order to read the poetry of love. He is thankful that time has enriched them with beauty and bliss that will lead them towards “a divine journey.” He knows that their love is “a ceaseless / melodious celebration.” Their love is the lamp and they themselves are its brightness. They are the rhythm to the song of love. Their journey is “an extension / of the boundless voyage.” With “nostalgic memories”, they hope to realise the “sun of a new bright light” so that they may walk the cosmic path together with “the evolutionary smile.” The poem that begins with the physical ends with the sublime. Physical love ends with the passage of time but the sublime love with which the lover in Padhy is blessed continues to shine and shower blessings which lead to celebration. The poem is the song of love that Padhy sings spontaneously. It flows from his blissful soul. Phrases like “melodious pages of time”, “sedulous lips”, “burning grief”, “pearls of love”, “the abyssal sea of quest”, “the rhythm of silence”, “the morphology of feeling”, “the dimension of affection”, “the inheritance of creation” are worth remembering. Simple figures like “Like a bird / You dream to fly” (20), “I circulate you / Like breeze / Everywhere” (30), “Life is a wave / Of joy and sorrow” (43), and “My dream silently streams” (28) appeal the heart that longs for love. The poet in Padhy is a traveller who soars high on the wings of imagination and sings the songs of love that echo and re-echo in the hearts of the readers who are also on the journey of life in the quest of blissful love. 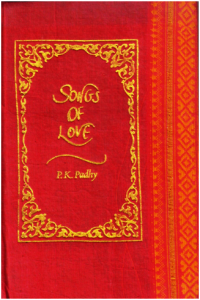 The songs in Songs of Love are indeed the songs of love which move the heart so profoundly that the readers cannot remain without praising them for their flowing lyricism, innate feelings and faithful longings and blissful celebration of life from physical to sublime.